Issue #43 begins a two-parter introducing the Red Guardian, the Soviet Union’s answer to Captain America (and with a connection to the Black Widow). But first, Cap has to become “acquainted” with the newest almost-Avenger, Hercules. Cap chooses to evade rather than use his knowledge of leverage that he usually lectures others about, but nonetheless he manages to impress the son of Zeus, who cites Cap’s skill and courage (for fighting him at all, I guess)? When Hawkeye and Hercules fly to China looking for Black Widow, who was pretending to be a Soviet agent while secretly working for S.H.I.E.L.D., Hawkeye takes on and is captured by the Red Guardian (while Hercules is busy fighting the Hydra of myth). It’s only a matter of time before Cap and the rest realize where H&H have gone. Hawkeye may be right, and staying put would be the “sensible” thing to do, but Cap knows there is a more important principle at stake: leaving no Avenger behind, international incident be damned. The political aspect of the dilemma isn’t followed up on; it may have been interesting, as their recent adventure in Latveria in issue #25 showed. In issue #44, the communists explain their devious plan to Hawkeye and Black Widow while Hercules continues to battle the Hydra. The rest of the Avengers arrive and fight the Chinese soldiers while Cap looks for Clint and Natasha, and is captured himself—but only temporarily. As we see, the Red Guardian is eager to prove his superiority over his American lookalike, which is harder than it seems, even with the Guardian’s enhanced speed and strength. Cap never misses a chance to teach, this time about the value of having been around the block a few times. …which gives the Red Guardian a chance to reveal what might seem like a sense of honor, wanting to beat Cap fair and square, but was probably only his interest in proving himself the superior man. Eventually the Avengers escape with the Red Guardian’s help, after he deflects a laser beam meant for Cap that ends up destroying the Chinese base, and with a critically wounded Black Widow, whom Red Guardian also saved, taking an earlier bullet meant for her… his wife. On their flight back home, Cap mulls the similarities and differences between him and his Soviet counterpart. 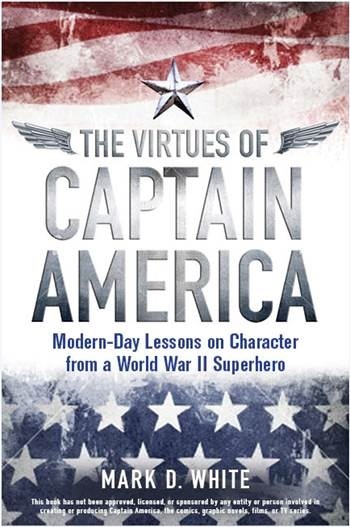 Cap recognizes a moral code in the Red Guardian even though it’s different from his own: both adhere to their own principles or ideals and refuse to sacrifice them for the sake of a mission (related to the formal sense of integrity I discuss in chapter 4 of my book). After they get Natasha to a hospital, Cap offers Clint sympathy and comfort, and counsels hope above all. In the final panels of the issue, Cap also offers some healing words to Natasha about her husband, explaining that he overcame his programming and became a hero before his death.